Minnesota Republican Rep. John Klineannounced his retirement in September last year. As his time in the House draws to a close, the chairman of the Education and the Workforce Committee reflected on his time in office and this year’s elections, and shared some retirement advice he received from a former statesman. Q: What was your path from being a Marine to running the Education and the Workforce Committee? Q: What do you think is your proudest accomplishment in Congress? A: A huge accomplishment, probably the biggest thing, was replacing No Child Left Behind with the better law — Every Student Succeeds Act. It wasn’t until a year ago when we were finally able to power through that. Q: What’s your take on the election? A: There were multiple phenomena that we didn’t see. I don’t think anybody alive two years ago would have imagined that Bernie Sanders was going to give Hillary Clinton a run. And, most of us never imagined that Donald Trump could possibly get the Republican nomination. So as we were watching this thing unfold, it was all new territory. There were a lot of concerns on my side of the aisle that Donald Trump would collapse or the Democrats would turn out huge numbers and Nancy Pelosi said we’re going to retake the majority because of Donald Trump, and all that stuff. And the truth is, she didn’t know. We didn’t know. Nobody knew. As I watched it unfold election night, I was like the rest of America, I was astonished. Q: Once you retire, what will be the first thing you do? A: I told myself I’m practicing for retirement because I wasn’t campaigning. My wife and I want to travel. We bought a new pop-up camper trailer and a new lightweight canoe to put on top. 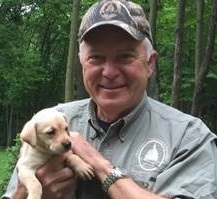 And a new Labrador retriever puppy. Those were retirement things. My puppy is six months old and her name is Lucy. Q: What hobbies will you continue in retirement? So, I’m not leaving here to go get a job but I’ll do some things. There are folks out there who have expressed interest in having me on their corporate board, so I’ve got to get that sorted out. My vast majority of time, I expect to be traveling and fishing.